Among the many smoking guns uncovered in the Wikileaks data dump, lurks documents that should give Catholics great concern. The latest Wikileaks data dump of internal records from George Soros’ Open Society Foundation exposes the most shocking of all his political alliances. According to the leaked Open Society Foundation documents, George Soros funds efforts to promote his radical socialist agenda of income inequality by using the bully pulpit of Pope Francis. Soros seeks to “engage the Pope on economic and racial justice issues” by lobbying the Vatican. The purpose of the Soros/Vatican collaboration skewers political to influence the 2016 U.S. Elections, thus securing the presidency for Soros’ handpicked candidate, Hillary Clinton. The Soros’ foundation clearly views Pope Francis as an important ally in the Soros income inequality socialist movement and in the prelude to the 2016 U.S. election. Notice how the radical leftists in the Soros reframe the words pro family as “growing inequality.” This grant description highlights the hijacking of language by the left by exploiting and twisting words for its own radical political advantage. Its perennial partner in promoting the transformational language is the leftist media. Another fascinating nugget in the Soros board meeting notes exposes its cozy relationship with Cardinal Rodriguez Maradiaga, the Vice Pope, and close confidante of Pope Francis. Cardinal Oscar Maradiaga of Honduras is described by the Soros operatives as ‘using his influence’ within the Vatican to promote the Soros radical economic inequality narrative. Clearly, Maradiaga has been identified by the Soros empire as a key player in the global radical income redistribution movement. And, indeed, Maradiaga rails against American capitalism at every opportunity. Soros’ team knows that Maradiaga will happily promote this initiative within the Vatican and, most importantly, with Pope Francis, his close friend. Who is PICO, the $650,000 grant recipient who will organize activities to engage the Pope on economic and racial justice activities? 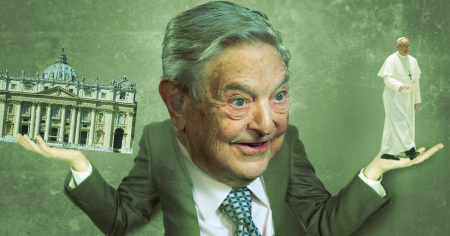 Soros tracks and funds its Vatican influence through PICO, among others. Open Society Foundation(OSF) recognizes that money spent at the Vatican is money well spent toward the global socialist Soros agenda. They’ve identified Cardinal Oscar Maradiaga as a key insider who is sympathetic and willing to promote the globalist cause. He will be a powerful ally and sympathetic ear to the Soros agenda, while Pope Francis uses the papal pulpit to promote the ideas. In 2011 the American Thinker exposed the individuals behind FPL and their leftist organization. Who could be against an organization that innocuously calls itself “faith in public life.” FPL is yet another of hundreds of Soros funded satellite organizations masquerading as well-meaning philanthropies which, in reality,promote his radical economic agenda of anti-capitalism and global redistribution, using community organizing tactics. How fortuitous that Soros found such a popular partner perched on the highest spiritual global platform, one who will promote the leftist agenda using the merciful language and political tactics of the papacy. Catholics serve as a huge and influential voting block in the U.S. election. For Soros, using the head of the Catholic Church to influence this key voting block is reflected in the OSF strategic planning notes. Swing the Catholic vote to the Soros Democratic candidate, and George Soros can dominate the American Presidency. This is not the first time that the unholy alliance of Soros and the Vatican successfully collaborated on a political project. In 2015, the Soros operatives, embedded in the Vatican, directed Pope Francis’ Environmental Agenda, by delivering for Soros and the UN, an Apostolic Exhortation on Climate Change, and a prized papal endorsement of the UN Sustainable Development Goals and the Pope’s apostolic blessing on the Paris Climate Treaty. Soros won the environmental trifecta sealed and delivered by Pope Francis. With the Soros-driven environmental deliverables now achieved by Pope Francis, it is now time to turn to item #2 on the Soros radical socialist agenda: global redistribution of wealth. Apparently, Soros knows that, once again, Pope Francis will assist in promoting the Soros socialist agenda. Stay tuned, Catholics, for contrived polling data that reflects your overwhelming support for more global and carbon taxes to redistribute your income more equally. Soros will use the Vatican to promote Hillary, his hand-picked presidential candidate.